You can still easily find the tool in a host of locations and it works fine for your normal folders, reports and data sources (though not the credentials). This tool is often another high ranking result when searching for SSRS migration tools. Released by Microsoft in 2012, it looks like a promising, “official” result. “Perfect! There is hope!”…maybe not. This tool works by generating a full array of PowerShell scripts based on your source content, whether that be from a native or SharePoint integrated instance. The first main roadblock is that you can only deploy to a SharePoint Integrated instance. Even though the PowerShell scripts are right there for you to edit, the source content is all explicitly called out and any potential alterations to force a deployment to a Native mode instance will involve a great deal of time editing and debugging. (Yes, I’ve spent hours doing this before!). If your target instance is a SharePoint integrated installation then great! Read no further. It’s not the easiest application to use but it will get you from A to B and you can dissect & edit the PowerShell code if you want to customize your migration. Please note that migrating report history requires direct modification to data in the report server catalog and is not publicly supported. Backing up the catalog before migration and verifying correctness of the reports after migration are strongly recommended. This Microsoft Page “Sample Reporting Services rs.exe Script to Copy Content between Report Servers” describes a sample script created by Benjamin Satzger at Microsoft, to migrate content between two Report Servers using the rs.exe application present in both modes of Reporting Services installation. It does cover some of the shortfalls of the RSScripter tool & it can also migrate content to a native mode installation, unlike the Reporting Services Migration Tool (but it will not migrate report history). There is some great documentation & details on the above Microsoft Docs page but it looks like the download link hasn’t (yet?) been updated from Codeplex, though the supported SQL Server versions do go right up to 2016 which is promising. The script is all written in VB.NET using the Reporting Services SOAP API. It’s not as easy to use or as flexible as the PowerShell module but it’s certainly a more complete and relevant option than the two I have mentioned thus far. No prior knowledge of VB.NET is required which is also a bonus. This is a workaround I have personally adopted for a while but relates mainly to keeping various environments in line, and not a core migration method like the others. I wanted to mention it though as the migration of SSRS content is usually driven by the need to keep multiple non-production environments in line. This method became part of my BI agile release process about a year ago though it is not without its own drawbacks. Prior to its inception, several days of my time were swallowed up re-building DEV or QA environments when they became too far out of date or some piece of work had impacted the content on a Report Server. I’d have to copy down our production database, remove or update the Scale-out deployment contents (servers), re-point every data source we have, manually (over 30!) to its DEV or QA counterpart & update any stored credentials. Then we’d have to update folder security to remove all the production permissions. This would also bring the environment down for the day or more that it took to get everything in place. While moving to an agile deployment method I began exploring better ways to keep our environments in line. If no releases are missed, backfilling at the time of each production release was the least time-consuming method of keeping all our DEV & QA environments up to production version & could actually be automated easily with PowerShell or as part of a CI/CD process. Kit is then automatically deployed to cold QA & DEV environments with the same production code. The main benefit of using this “backfill” method is that it removes the need, in most cases, to restore an entire database, recovering encryption keys, re-pointing data sources & altering security which can take more than a few hours to complete manually, depending on the size of your SSRS instance. 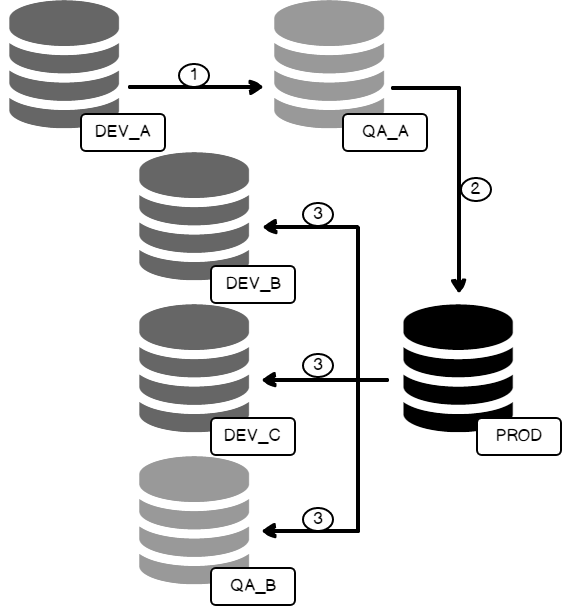 This is a bulk method approach but much more efficient than doing a database restore through Management Studio. It is literally a single command. The -IncludeSupportDBs flag I use here is actually designed to include the ReportServer and ReportServerTempDB anyway but seeing as those are the only 2 I am migrating, I have called out the ReportServer DB and I’m using the flag to bring the TempDB over. You can then augment this script with the Reporting Services module to fix data source connection strings & make any further environment specific changes, which is actually my preferred migration method detailed in the conclusion below. Similar in functionality and flexibility as the old RS Scripter, the official PowerShell module allows you to download & upload individual items, specific folders or a full instance of content. You can also utilize the new REST API for SQL Server 2016 installations. Here are a few code chunks for tasks you might perform during a migration. This code chunk will migrate from a source environment, down to a local temporary folder then back up to the destination environment. Setting the $Recurse variable to $true will add that flag to the commands and include subfolder contents too. It’s a great way to quickly migrate content but be careful to note that this only migrates reports, shared data sources & datasets. $encKey = Read-Host "Please provide a location to store the new encryption key (E.g. C:\Encrypt_Key.snk)"
$encKeyPass = Read-Host "Please provide the Password for the Encryption Key"
Write-Debug "Encryption Key location: $($encKey)"
In this script excerpt, I utilize a process I have implemented to backup all shared data source information within SSRS to a database table. See the Appendix below for that script. I then prompt the user for all of the passwords so we aren’t storing them anywhere. You can consider using the hosts file to negate the need to update connection strings but we’ve opted not to use that method. throw "$($moduleName) module is not installed and could not be added"
Write-Verbose "Connect to the Web service"
Write-Verbose "Open DB connection for data source reference info"
Write-Verbose "Define Query to pull data source settings from source table"
Write-Verbose "Loop through each data source row to update target SSRS Data Source"
Write-Verbose "Retrieve Definition for data source $datasourcePath"
Write-Verbose "Updating Connection String and Stored Credentials"
$password = Read-Host "Password for $($row.Item('UserName'))"
Write-Information "Migrate the DB using dbaTools"
Write-Verbose "Restoring Database from $($backupLocation)"
Write-Verbose "Database restored to $($targetDatabase) on $($targetInstance)"
Write-Verbose "Get SQL Version for $($targetInstance)"
Write-Verbose "Connecting to $($reportServer) default instance"
Write-Verbose "Setting up RS Database $($targetDatabase) Version:$($SQLVersion.Value) on $($targetInstance)"
Write-Information "Restore the Encryption Key"
Write-Verbose "Restoring Encryption Key from Source"
$encKey = Read-Host "Please provide local encryption key for Database Source (E.g. C:\Encrypt_Key.snk)"
Write-Information "Please remember to update the Scaled out servers in SSRS"
to that of the parent folder. This will grant DOMAIN\User Content Manager permissions on the root folder Only. Write-Verbose "List out all sub-folders under the $($RsFolder) directory"
Write-Verbose "Adding Folder Parameter to Array"
Write-Verbose "Granting $($Identity) $($role) permissions on $($folder)"
Write-Verbose "Removing $($Identity) permissions from $($folder)"
Write-Verbose "Setting $($folder) to Inherit Parent Security"
Using dbatools Invoke-DbaSqlCmd command removes all servers except the specified servers from the dbo.keys table in the SSRS database. Write-Verbose "Delete all Scale Out Keys not attributed to servers: $($serverlist)"
$command = "DELETE FROM [$($targetDatabase)].[dbo]. [Keys] WHERE MachineName NOT IN ($($serverlist))"
This removes all subscriptions in a provided folder with a Recurse flag to include all subfolders. Write-Verbose "Recurse flag set. Return all subscriptions in Folder:$($RsFolder) and sub-folders"
Write-Verbose "Recurse flag not set. Return all subscriptions in Folder:$($RsFolder) only"
Write-Verbose "$($subs.Count) Subscriptions will be deleted." Write-Verbose "Data Source Folder did not starts with /. Updating!" Write-Verbose "Open connection to Database server"
Write-Verbose "Create destination table if it does not exist"